Portrait, Pauline Gracia Beery Mack. Courtesy of the Texas Woman's University Libraries. Image available on the Internet and included in accordance with Title 17 U.S.C. Section 107. Dr. Pauline Beery Mack conducts bone density reserach for NASA. Courtesy of Texas Woman's University. Image available on the Internet and included in accordance with Title 17 U.S.C. Section 107. Pauline Beery Mack and her husband, Warren, look at a map with the locations of science clubs in the U.S. Courtesy of the Smithsonian Institution Archives. Image available on the Internet and included in accordance with Title 17 U.S.C. Section 107. MACK, PAULINE GRACIA BEERY (1891–1974). Pauline Mack, research chemist and college administrator, was born on December 19, 1891, in Norborne, Missouri, the daughter of John Perry and Dora (Woodford) Beery. After earning a bachelor's degree in chemistry at Missouri State University in 1913 and chairing the science departments of three Missouri high schools, she was awarded a master's degree by Columbia University in 1919 and joined the faculty of Pennsylvania State University. She married Warren Bryan Mack, a botanist, on December 27, 1923, and completed a Ph.D. at Penn State in 1932. Beginning as a chemistry instructor for home economics students, Pauline Mack gradually built an international reputation for research studies involving applications of chemistry to foods and textiles. She experimented with colorfastness in textiles, originated and directed the Pennsylvania Mass Studies in Human Nutrition, and directed research projects in child growth in cooperation with the medical schools of the University of Pennsylvania, the University of Brussels, and Children's Hospital of Philadelphia. During her years at Penn State, she directed the Ellen H. Richards Institute for research in foods, shelter, and clothing, and was named to the Marie Curie and Priestly lectureships. During World War II she did research on calcium for the army. She was awarded the Garvan Medal of the American Chemistry Society in 1950 for her research in bone density. Dr. Pauline Beery Mack with some of her research associates at TWU. Courtesy of the Texas Woman's University Libraries. Image available on the Internet and included in accordance with Title 17 U.S.C. Section 107. 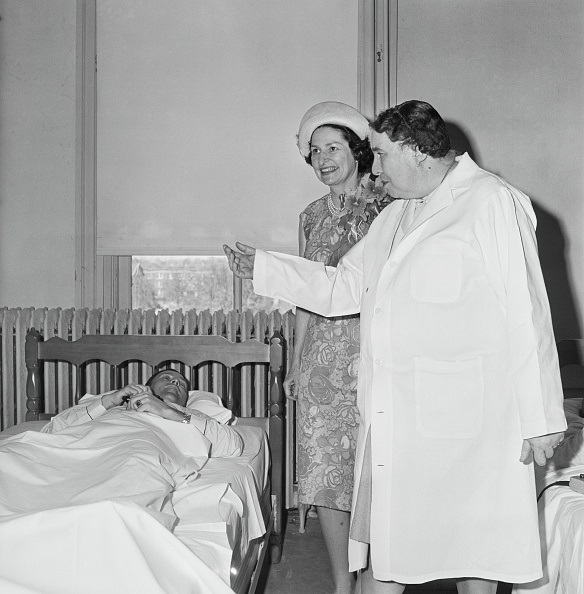 Dr. Pauline Beery Mack shows First Lady "Lady Bird" Johnson her bed-rest experiment for NASA, 1964. Courtesy of Getty Images. Image available on the Internet and included in accordance with Title 17 U.S.C. Section 107. A sign in Denton congratulates Dr. Mack and her colleagues for their research with NASA's Skylab, circa 1960s. Courtesy of the Dallas Morning News. Image available on the Internet and included in accordance with Title 17 U.S.C. Section 107. Mack assumed the position of full-time dean and director of research in the College of Household Arts and Sciences at Texas State College for Women (now Texas Woman's University) following the death of her husband in 1952. Within a decade she transformed the household arts college into a research facility with laboratories for research in X-ray technology, radiographic bone densitometry, electron microscopy, bionutrition, and bioscience. She retired from the deanship in 1962 to devote her full attention to the college's research foundation. As director, she led a team of researchers and doctors in conducting fiber and food studies on the cotton plant and secured a series of grants from the National Aeronautics and Space Administration to study the effects of space flight on bone density. With adult males as subjects of extended bed-rest studies that simulated the effects of null gravity and confinement in a space capsule, she measured the loss of bone calcium and phosphorous resulting from inactivity with X-ray equipment of her own design and used the results to develop special diets to minimize bone demineralization for the Gemini and Apollo astronauts. She conducted similar research on primates for the biosatellite program in cooperation with the NASA research center in California. In 1970 she became the first woman to receive the astronauts' Silver Snoopy award for professional excellence. Professor Mack held fellowships in the American Institute of Chemists, the American Association for the Advancement of Science, the Society for Research in Child Development, and the American Public Health Association. She was elected to the Society of Chemical Industry in Great Britain and, in 1958, to the Royal Society of Health. She wrote Chemistry Applied to Home and Economy (1926) and Stuff-The Science of Materials in the Service of Man (1936), as well as more than 200 scientific papers; she was coauthor of numerous research studies and reports. She received the Piper Professor Award for distinguished Texas faculty in 1959. She was a member of the Committee on Rayon Standards of the American Standards Institute, the advisory committee of the Journal of Home Economics, and the Excerpta Medica abstracting service. She continued to direct the research foundation at Texas Woman's University until illness forced her to retire in 1973 at the age of eighty-two. She died in Denton on October 22, 1974, and was buried in State College, Pennsylvania. American Men and Women of Science, 12th ed. Who's Who of American Women, 1970–71. Women's Collection Archives, Texas Woman's University. Handbook of Texas Online, Judith N. McArthur, "MACK, PAULINE GRACIA BEERY," accessed April 20, 2019, http://www.tshaonline.org/handbook/online/articles/fmabl.